Janet Marchibroda serves as the President of Alliance for Cell Therapy Now. She also serves as Senior Vice President, Health Policy at the Bockorny Group and Fellow, Health Innovation at the Bipartisan Policy Center. Ms. Marchibroda is a seasoned health policy leader with extensive experience in health care, innovation, and technology; her work currently focuses on advancing innovative strategies for improving health and health care, accelerating the availability of safe and effective cures and treatments for patients, and effectively using data and technology to improve the lives of individuals. 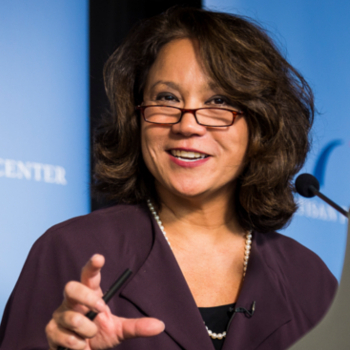 She previously served as Director of the Health Innovation Initiative and Director of the CEO Council on Health and Innovation at the Bipartisan Policy Center (BPC), a non-profit organization formed by former Senate Majority Leaders that combines the best ideas from both parties to drive the development and adoption of principled and politically viable policy. As Senior Vice President, Health Policy at the Bockorny Group she supports multiple clients, focusing on biomedical innovation, digital health, prevention and public health, and health innovation. Marchibroda also served as Chief Health Care Officer for IBM, Senior Vice President for Health Policy and Technology at CNI, and Chief Operating Officer for the National Committee for Quality Assurance, an organization devoted to improving the quality of health care for Americans. She also served as founder and CEO of the eHealth Initiative, a non-profit, multi-stakeholder member organization that was instrumental in advancing legislation that provided more than $30 billion in investments in health technology. She also served as Executive Director of Connecting for Health—an initiative supported by the Markle Foundation and Robert Wood Johnson Foundation and interim Chief Operating Officer for the National Coalition for Cancer Survivorship. Marchibroda also co-founded and served as Chief Operating Officer of a healthcare-related electronic publishing, data, and consulting services company which was later acquired by Bertelsmann AG. Marchibroda also supported the Centers for Disease Control and Prevention (CDC) in improving immunization rates through market adoption of clinical software with immunization-related capabilities and rapidly deploying clinical, epidemiological, and data analytics teams to 30 local communities across the country to support mothers and babies impacted by the Zika crisis. She also led stakeholder engagement activities for the National Coordinator for Health Information Technology within the Department of Health and Human Services following passage of the HITECH Act. Marchibroda has been recognized as one of the Top 25 Women in Healthcare by Modern Healthcare, one of the Most Powerful Women in Healthcare IT by Health Data Management, and a recipient of the Federal Computer Week Top 100 Award.